the dreaded and disgusting oyster goblet. Do not attempt this goblet anywhere. 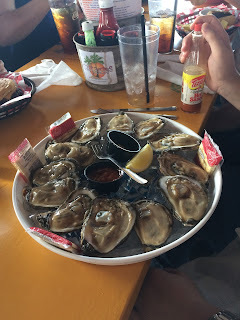 Today at lunch, we visited a new (to us) beach restaurant, one whose menu actually listed raw oysters on the half shell. I'm happy to report that these oysters did not come in a goblet or glass of any kind. Chase declared their quality hit-or-miss, and many were too sandy, but I think we can all agree that they represent a big step forward for beach cuisine. For those who track our beach movie-watching, in addition to a couple of UFC events, we've now consumed an SF film and, of course as a late offering, the newest Segal. It was everything we expected it to be.